Meet Oscar. Oscar likes vaccuums. Scratch that, he loves them. Eats, sleeps, dreams, talks about, plays with, vacuums. We wish we were imaginative enough to make this story up, but it is all truth. Oscar’s mom, Sarah (the owner of Pepper Lou Turbans – darling headwear for little girls that we swoon over!) isn’t quite sure where this fascination originated, but we love to hear all about Oscar’s vacuum adventures. One day while we were all at a play date we overheard Oscar go into our friend’s office, get wide eyed when he saw their vacuum and said under his breath excitedly, “They have an Oreck!” At only three years he can tell you features, shapes, colors, and uses of just about any vacuum on the market, he’s passionate about it and he can’t help but share it with anyone who might inquire. We wanted you to meet Oscar today because he is simply the sweetest boy, caring and loving to all, and loyal to a fault. We so admire his dedication, his individuality and fearlessness to blaze an unbeaten path. How old are you? Three. Who is your mom? [points] You! What does your mom do? Play. Who is your dad? Daddy! What does your dad do? Work. What do you want to be when you grow up? A vacuum. What is your favorite food? Umm, carrots. Gross ones. I like gross carrots. What food do you not like? Umm, stinky ones. What is your favorite animal? Umm, not a cow. A moose! Where do you want to live when you grow up? At home. Who do you want to marry? Daddy. What do mom and dad do after you go to bed? Sleep! Who is your favorite person? Mommy and daddy and Pepper [sister] and Oskie [himself]! What is your favorite book? Umm, a vacuum one. Who is your sister? Pepper. Where did Pepper come from? A crib. What is your favorite thing to do? Color. What would you buy with a million dollars? Vacuums! Why is the sky blue? Cause at morning it’s blue. At night it’s at black. At morning it’s a blue. How would the world be different if animals could talk? [laughing] No! The animals don’t talk. What are 5 words that describe you? Umm, an owl. I could eat you. If you could make one rule that everyone had to follow, what would it be? A vacuum. A Hoover T Series. If you could give a gift to every child in the world, what would it be? A vacuum. What is your favorite place in the world? Home. What is your favorite vacuum? Hoover T Series. Cause it has a hose and a filter and a HEPA filter. And brushes. And wheels. Why are vacuums so cool? Cause Bissel is. 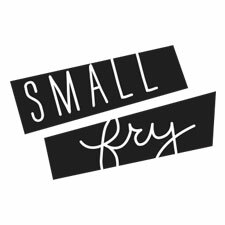 Meet more Small Fries: Ollie and Zuri. Such a cute idea! And how adorable is this little guy!?! What a cutie! And I absolutely love this interview, how very sweet. He seems like such an awesome person. My good friend’s son is also obsessed with vacuums, Dyson to be exact. She even threw him a Vacuum themed 3rd birthday party. Quirky dudes these guys. You have the most awesome Mom ever! You are so lucky to have parents that embrace your passion. You are an extra special little guy. Never change. P.s. I still remember the very day I got my first Dyson vacuum that was 8 years ago and it is still going strong! Vacuums are super awesome and so are you! eeep! this little guy is destined for a big life! what an adorable little boy. i love his passion for vacuums! thanks for sharing this interview with this adorable little sweetheart! This boy is the cutest! His love for vacuums makes me smile. So darling. He is adorable! and what passion at such a young age! You go Oscar! That’s my nephew! Love that kid! And I love that his mom is so supportive. A lot of moms would try to push their kids away from this obsession. But not Sarah, she embraces him and his love of vacuums. I think that is one of a kind. Such a great kid! That is one cute kid…and an AMAZING mama. My now 14 year old had very “unique” obsessions when he was young…the strangest being The Black Angus restaurant symbol (i know). My family always gave me a hard time for fostering his weird obsessions but I just always let his beautiful mind guide my way to parent him…not the other way around. He is now 14 and a BRILLIANT musician…to say he makes me proud is an understatement. To this mama I say….GREAT JOB…and may BEAUTIFUL vaccum loving mind continue to bloom! This is the cutest!…I love Sarah!…and her boy is adorable! Such a sweet boy. Love seeing the lives of these little ones. Sarah, your little man is the best! So full of personality. I don’t even have words. I too love vacuums. I’m actually doing a photographic series on vacuum portraits. Email me from this form and I’ll send you the link. I’d love to hear what oscar thinks of my photos. Tell him I’m photographing a Royal from the 50’s. Seriously, I want to be in touch. what link?? i can’t wait to show him the photos! i can’t get over this love for vacuums! so precious! I’ve been reading SF for awhile now but have yet to comment…Oskie you KILL me!!! What a little sweetheart! Cheers to mom for letting him be himself! I love that handsome Oscar, and his amazing mama! Osc is going to do big things because his mom is so supportive and encouraging. Lucky kid! Oh, I love this!! He sounds like an amazing little boy! It is true…all we want is for our little ones to feel loved and accepted! 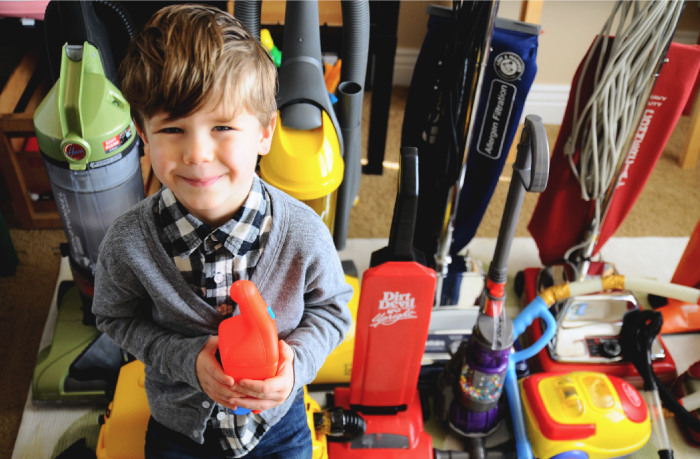 When I was a nursery leader a few years ago, one of the moms warned me to NEVER bring up vacuums with her 3yr old b/c he was obsessed with them (at the time). If he ever heard the word, he’d cry until he could use one. It’s strange that this is a common obsession amongst kids! My 2yr old is terrified of them. I loved reading this interview! I have a four year old son, named Oscar James, and one of his nicknames is Oskie-bug. He is terrified of the vacuum.